In engaging different interpretations of Augustine’s development, Warfield helpfully argues for the legitimacy of his 386 conversion, and essential continuity in his thought from this point through the remainder of his career (pp. 372-383). The different phases of his thought are not rigid “turns,” (as often represented in the revisionist scholarship), but reflect a consistent unfolding of his thought in response to his primary theological opponents – first Manicheism, then Donatism, then Pelagianism. For me, this raises the whole question of how the various other systems with which Augustine struggled – especially Manicheism and neo-Platonism – related to his conversion to, and development in, catholic Christianity. 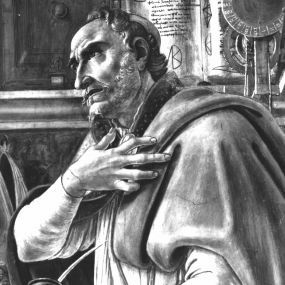 Its clear that while Augustine ultimately rejected these other philosophies and embraced the orthodox Christian faith, they nevertheless left some kind of permanent stamp upon his thought – in some ways in forming modes of thought and expression as he struggled against them (more Manicheism), and in other ways in joining in with and aiding his own theological construction (more neo-Platonism). And this in turn raises a larger question: how do various non-Christian and sub-Christian philosophies and religions relate to Christianity? Most people would agree with C.S. Lewis’ assertion in Mere Christianity that “all … religions, even the queerest one, contain at least some hint of the truth.” To what extent can a non-Christian philosophy (such as neo-Platonism, or Kantianism) have a preparatory role in someone’s conversion, opening and enlarging their mind to Christian concepts, or (in the case of nihilism or existentialism) demonstrating the need for Christian concepts? To what extent can a non-Christian philosophy co-exist with Christianity, or form categories of thought or language in which a Christian theology is presented? Of course there are dangers here – but most great theologians in church history have been profoundly marked by non-Christian philosophies (consider Augustine by Platonism, Aquinas by Aristotelianism, and Barth by Kantian as three classic examples). As I continue to engage with Augustine (and Anselm), I hope to understand better how they sought to relate the uniqueness of Christianity with the reality of general revelation, common grace insights in non-Christian systems of thought – neither accommodating the gospel to the “spirit of the age” nor ignoring whatever legitimate bearing on the truth it may have.